Although I do work with Valrhona Chocolate, it doesn’t stop me from trying and/ or appreciating other brands: after all – a little objectivity never hurt anyone did it? In this case, I don’t believe these are actually available in the UK as yet, but I’m sure it won’t be long before someone snaps them up as an exclusive product range. Le Carré des Chocolatiers is a Swiss brand, whose idea is to take you on a sensory journey, initiating you into the world of hand-crafted, contemporary-style chocolates. The group of chocolatiers that make up Le Carré des Chocolatiers are demanding master-craftsmen who use ingredients of the highest quality, producing original chocolates from the purest cocoa butter, drawn from the finest and rarest varieties of cacao beans. They all share a passion for their work and their outstanding talents. Le Carré des Chocolatiers stands for on-going innovation and renewal. Artisans from different regions and backgrounds are invited to create the limited editions of chocolate tablets produced under the SUMMUM line, while 8 other product lines lead you through successive discoveries and new worlds of taste: spices, herbal infusions, Grands Crus, flavours of the Mediterranean, the art of chocolate truffle, the crunchy pralines collection, and blends of herbs and fruit. Characterized by a very modern design and an urban look, Le Carré des Chocolatiers represents a wider culture, one that is aware of the history of chocolate, of the stories and anecdotes surrounding it, of culinary tradition, modern art, current events, literature, fashion and the cinema. Next Post A little Star. 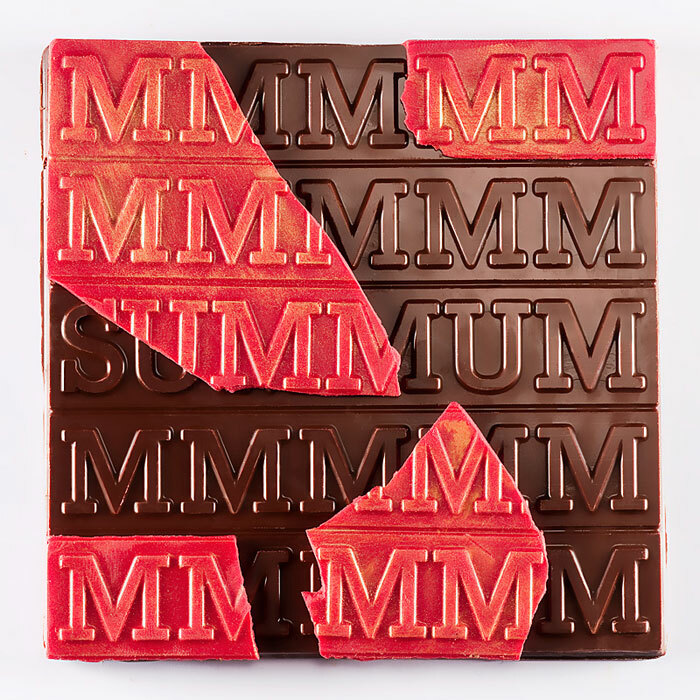 Wel, I don’t know about taste but that summum bar is certainly visually striking!